After a couple of months of unseasonably dry weather, the Pacific Northwest winter rains have finally began to come down. And as a result, my motivation and inspiration for photography have both gone into hibernation. This is pretty typical of the winter though. To be honest, I would rather keep dry and warm in the comfort of my home, rather than out shooting in the wind, rain and cold. Then add the fact that it gets dark at 4:00, so after work shooting is out of the question. But I have felt stuck. This is painfully evident by the fact I've been on the same two rolls of film for a couple of months now. To get re-energized and out of the creative funk, I have been trying to meet up with various people in hopes their creative juices might rub off. Twice within one week, I somehow ended up at the same coffeehouse and wandered over went to the same cemetery to take pictures. 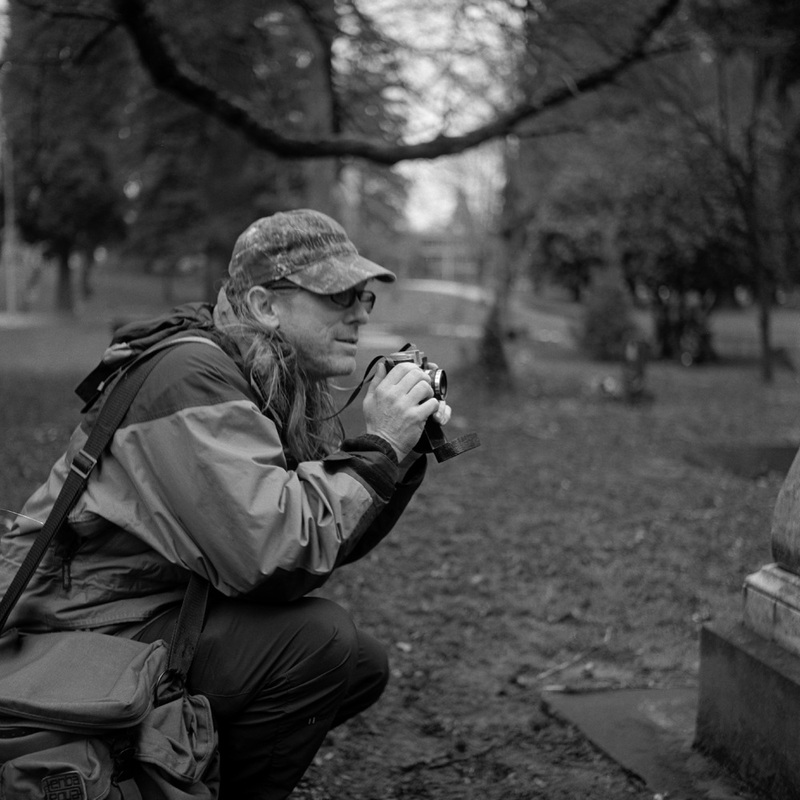 Perhaps photographers are drawn to the darkness and morbidity of cemeteries. Or maybe that's true of people in general. Fancy boots with superflous buttons. Very stylish. On one of the few dry days recently, I met up with my dear friend Kelsey at Oblique Coffee (http://obliquecoffeeroasters.com/) on SE Stark. Luring her with the promise of cookies, I gave Kelsey a quick Photography 101 lesson, and we then went out to Lone Fir Cemetery and Laurelhurst Park to take photos. Lone Fir is a very old cemetery in the heart of SE Portland, where many of Portland's founding fathers are buried. Chock full of history and moss covered tombstones. I armed her with my trusty Olympus OM-1 and a roll of expired Tri-X, and set her loose to hunt and shoot zombies at the cemetery (no apocalypse yet, but stay tuned). Kelsey did take some very lovely photos, especially for her first time with film and an entirely manual SLR. Chris stopping to snap a photo of a tree that has grown around a tombstone. The following weekend, I met up with a couple of fellows from Flickr. We all peruse the "I Shoot Film" group there, and were trying to plan a meet-up of sorts to talk film, cameras, developing, and eventually take some photos together. Chris and Tim were both really nice and interesting guys, and you should check them out on Flickr. Tim's feed can be found at http://www.flickr.com/photos/timvo/, and Chris's at http://www.flickr.com/photos/squim. There are a few of the winners I got out of these two excursions. Dark, eerie, creepy. Which exemplifies cemeteries, winter and perhaps even some photographers. As a disclaimer, the last photo in the set above was taken at Cafe Vita on Alberta, and not even related to the others. Except the fact that I love coffee and pastries. And wanted to share it anyway. The photos on this page were taken on a Rolleiflex 3.5 MX-EVS, with Illford HP5+ film. It was developed in Kodak D-76 for 9 minutes.